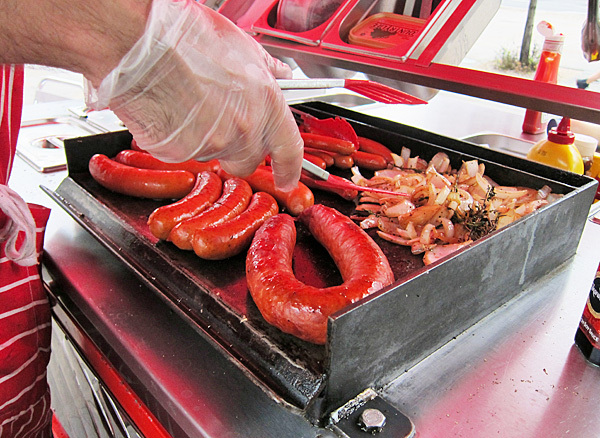 Ever since Big Apple Hot Dogs regular SB brought me and S to Abiye’s shiny dawg-peddling cart I’ve been dreaming non-stop about the beautiful juicy franks and singing their praises to anyone who’ll listen. 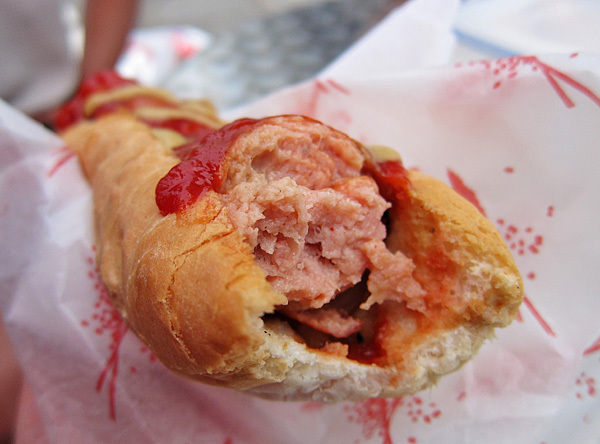 After rattling on about the dogs again to a couple of friends last night I decided it was high time to put my pen where my mouth is and blog about the awesomeness that is Big Apple Hot Dogs. 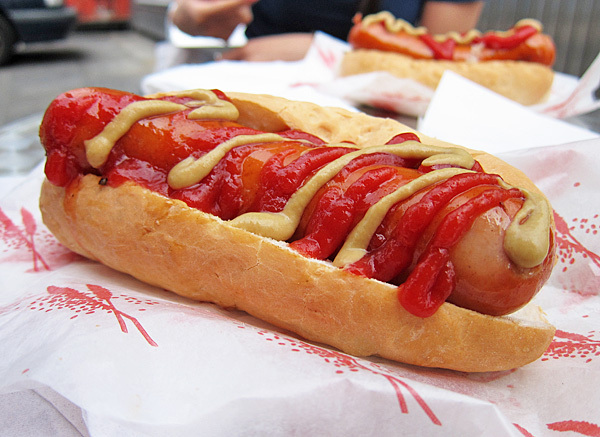 Parked just opposite Old St tube every week (Tues – Fri 12-6pm), BAHD is owned and run by Abiye, a longtime lover of the American hot dog. He’s spent time in NYC and it shows – his hot dogs are the real deal and in my opinion you’d be hard-pressed to find a finer specimen here in London. We started with a Big Frank (those with a smaller appetite can opt for the Frank Junior), an oak-smoked organic free range pork beauty seasoned with paprika, nutmeg and black pepper nestled in a soft pliable bun freshly made that day by local baker H.W. Anderson of Hoxton. The first bite was amazing. As my teeth sank into the frank the thin natural casing snapped pleasingly and juicy porky goodness burst forth. The pillowy bun, bed of sweet thyme-specked onions and my messy squirts of ketchup and polish mustard (chosen from the wide selection of condiments available) all added to the heavenly experience. A steal at £3.50. Needless to say I wasn’t about to stop at one and Abiye had a special treat in store for us (a benefit of going with a BAHD groupie! 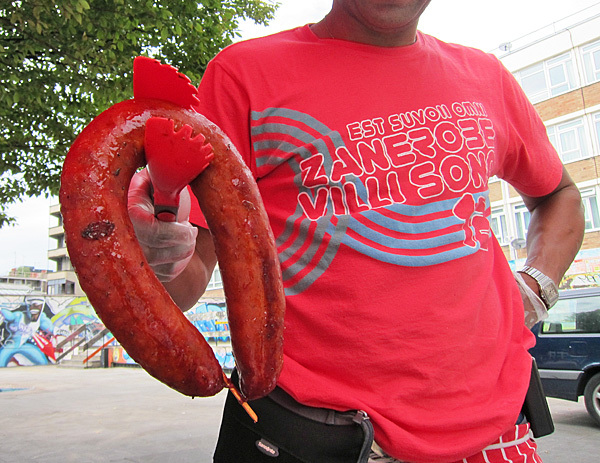 ), a giant mustard-infused pork sausage so large that it had to be sliced for easy consumption. 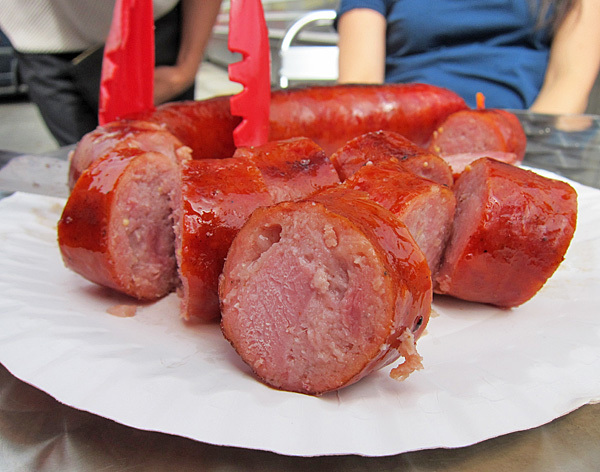 The meaty number had a punchy flavour and boasted coarse chunks of tender pork that gave it a much firmer texture than any sausage I’ve ever eaten. We rounded off with the long skinny Pimp Steak – pure beef with a robust intensity that brought to mind a Slim Jim. I had my share without bread but the tasty mildy-spiced dog would be ideal in a bun. 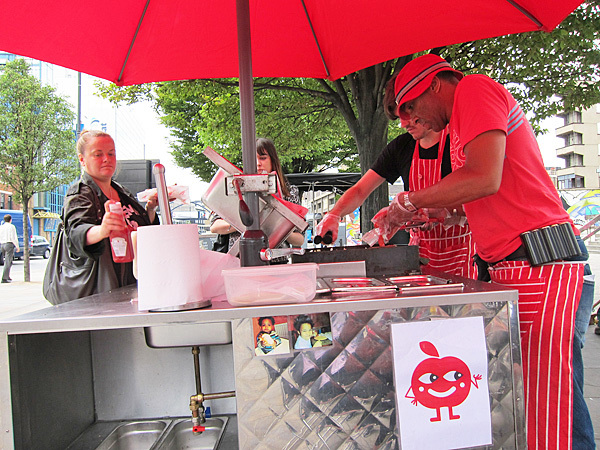 All ye hot dog lovers hurry down to Old Street now! Best. Dogs. Ever. ~ by gourmettraveller on September 25, 2011. It’s NOT FAIR!!!! Virtually impossible for me to get to old street in good time during the week. Sob. Yep. They are a lot tastier than the Godfather dogs. 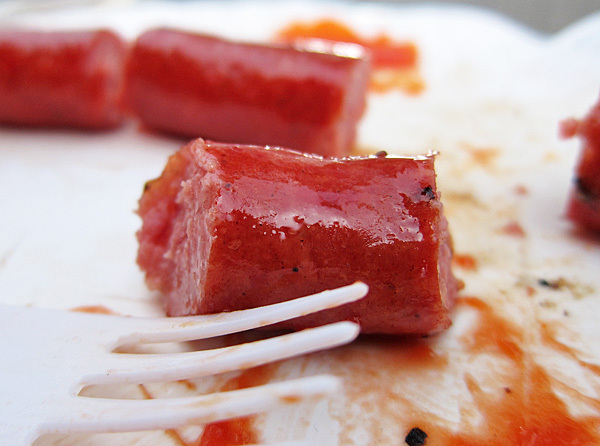 I dont usually go for street dogs in nyc but I would try these. Oh my god!!!! What Hot Dog!!! The second picture, the hot dog with tomato and mustard, is spectacular.